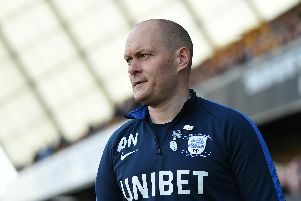 Alex Neil thinks Queens Park Rangers have benefited from a sprinkling of experience since their last meeting with Preston. The sides met at Deepdale on the opening afternoon of the season, an Alan Browne header giving PNE a 1-0 win. QPR lost their first four Championship games, a run which piled the pressure on Steve McClaren who had only been appointed in June. But they recovered from the torrid start and climbed as high as eighth place. Their defeat at Sheffield United last Saturday ended an unbeaten run of six games. North End manager Neil said: “I spoke to Steve after the game here and he thought their side was too young and needed some experience. “They went out and got Tomer Hemed, Nahki Wells and Geoff Cameron. “That picked them up and they’ve gone from there. “I know Geoff Cameron is injured at the moment but they got better for that extra bit of experience. “Their team isn’t actually that much different now to the one we played at the start of the season. Neil admits the August victory over QPR seems an age ago. “You get to this stage of the season and think it has lasted forever,” said Neil. “Then when you get to the last six, seven or eight games of a season, you think it has flown by – it’s quite strange. North End have won their last two visits to Lofus Road. Callum Robinson and Browne were on target in a 2-1 win there last April. The campaign before with Simon Grayson in charge, the Lilywhites won 2-0. Said Neil: “I like going to Loftus Road, it is one of those grounds where it feels like the crowd is on top of you and that creates a good atmosphere. “Last season with Preston we won 2-1 having been 1-0 down, we played really well in the second half. “The time before when I was at Norwich we had a man sent off inside 45 seconds which didn’t help. “QPR have a vocal crowd who get behind the team. McClaren’s men are in 11th place as they get ready to face North End. They won three games on the bounce in December and then drew twice. There was a win in the FA Cup over Leeds, before they went down to defeat against Sheffield United. Wells, who is on loan from Burnley for the season, tops their scoring charts with six goals in the league. Luke Freeman has five goals and Pawel Wszolek four. Massimo Luongo will miss the game as he is playing for Australia in the Asia Cup. Ex-North End defender Alex Baptiste is unlikely to be involved, his last game for QPR being in August.